Vitamin A is a fat-soluble vitamin found in nature in the form of retinol, in its equivalent retinoid (animal origin) form or as pro-vitamins (plant origin) called carotenoids. The latter are transformed into vitamin A in the liver. Vitamin A is essential not only for the mechanism of vision but also for cell differentiation. For this reason it is necessary for the growth, the reproduction and the integrity of the immune system. Retinol is obtained naturally from our diet. Foods rich in vitamin A include animal liver and cod liver oil, eggs and dairy products; large amounts of carotenoids are found in yellow-orange fruits and vegetables (tomato, carrot, pepper, pumpkin, apricot) and in some green leafy vegetables (lettuce, asparagus, broccoli). Topical vitamin A treatments in the form of retinol are highly effective for promoting cellular turnover and epidermal renewal to even skin tone and diminish the signs of both intrinsic and extrinsic skin ageing. Vitamin A is recognised as one of the best active ingredients to fight all signs of ageing, but also those caused by photo ageing due to UV exposure. It effectively neutralises the molecule, which gives rise to the formation of free radicals, the main trigger for skin ageing. Most importantly, it encourages cell turnover and facilitates the removal of dead cells, leaving space for the underlying, younger skin. This also helps to prevent the accumulation of melanin: the dark spots are kept under control whilst the existing ones are lightened. As retinol is also photosensitising, it is recommended that a broad-spectrum sun protection is used as part of any skincare regime. For retinol to be topically effective, it must reach a concentration of at least 0.6% in the skin. ZO Skin Health and Medical use a 1.0% concentration of retinol. Although the sun is excellent for promoting vitamin D production in your body, it also carries a huge risk. The effects of ultraviolet (UV) rays, a component of solar radiation that is particularly rich in energy, is that it can damage the skin and eyes. However, it is not just invisible UV rays which are harmful to the skin. There are some portions of visible light that cause harmful effects on the skin, called HEV light. However, it is not just invisible UV rays which are harmful to the skin. There are some portions of visible light that cause harmful effects on the skin, called HEV light. HEV (High Energy Visible) light is a high-frequency light with a wavelength between 400 and 500 nm in the visible spectrum (blue / violet). At the epidermal tissue and dermal level, it causes the formation of reactive oxygen species (ROS), responsible for DNA damage and activation of enzymes metalloproteases matrix (MMPs) that degrade the dermal fibres and can cause premature ageing. 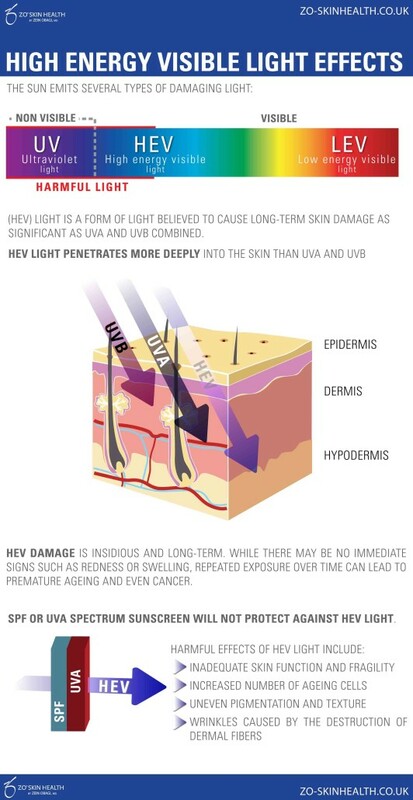 High-Energy Visible (HEV) Light is a form of light believed to cause long-term skin damage as significant as UVA and UVB combined. HEV damage is insidious and long-term. While there may be no immediate signs such as redness or swelling, repeated exposure over time can lead to premature ageing and even skin cancer. While it is well known that sunlight can age and damage skin, not everyone is aware that sunscreens cannot provide complete protection against harmful UVA, UVB and HEV rays. The new Oclipse Sun Spray SPF50 and Oclipse Smart Tone Broad-Spectrum Sunscreen SPF50 protect against harmful UVA and UVB rays and HEV light and help guard skin against photo-damage and future signs of ageing. In our society, tanned skin is often synonymous with healthy, young and beautiful skin. Unfortunately, repeated exposure to the sun leaves indelible marks, even on the most perfect of skin. Regardless of whether you skin has burnt, reddened or tanned from the sun, they are all symptoms of your immune systems response to ultraviolet radiation, which is a consequence of RNA damage to skin cells. Ultraviolet rays are divided into three categories, according to their wavelength: UVA, UVB and UVC. UVC rays are not a problem, thanks to the atmosphere that filters them. However, UVA rays can still penetrate the dermis, while UVB rays reach the surface layer of the skin and discharge all their energy (higher than UVA) into epidermal cells and especially DNA. The sunburn you experience is caused by UVB rays. 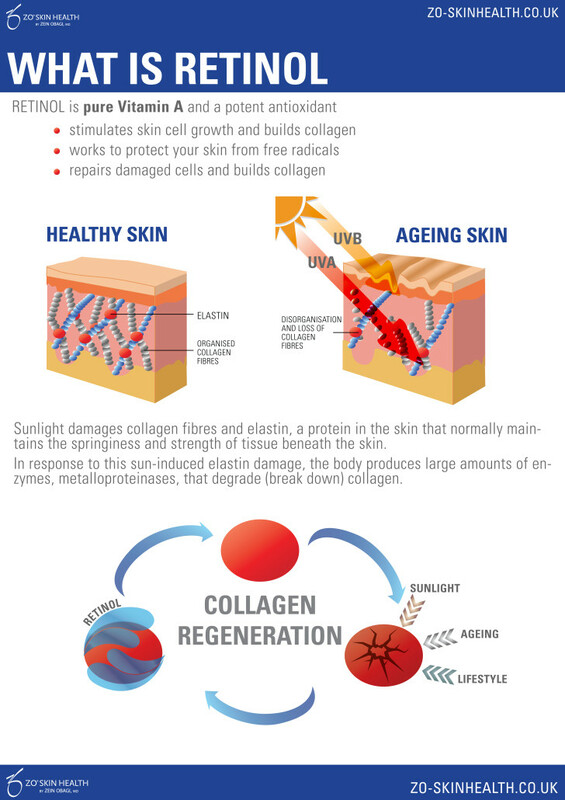 Nevertheless, though UVA rays do not cause sunburn, in the long run, they can lead to a degeneration of elastic fibres and collagen in the dermis, which results in a loss of elasticity in the skin. The target of solar radiation is cellular DNA and can cause a considerable amount of damage to the double helix. In response, your body begins the production of free radicals, releasing destructive enzymes called hydrolases. This phenomenon is called photo-ageing, the biological process by which the sun’s rays causes premature ageing at the deepest point of the skin. It is important to protect your skin from UVA and UVB rays with a good sunscreen. If the skin is sensitive it will require a cream with a sun protection factor (SPF) of at least 30. ZO Skin Health and Medical offer effective daily solutions to minimise UV damage, prevent DNA damage and protect the skin from environmental aggressors to improve overall skin health.